Thanks for taking a moment to stop by the website. I hope the content included here helps illustrate the kind of writer, editor, and scholar I could be for Edutopia. Please feel free to contact me directly at nicholasjaworski@gmail.com. A presentation I gave a few years ago. The core mechanic of PechaKucha is that you get to show 20 slides with each one being 20 seconds long. You have no control over advancement of each screen. Hilarity can ensue. A podcast pilot I created for a large music education organization. Since research shows us that whiteboard animations help viewers retain more information, I also created this fun whiteboard video for the pilot pitch. I also created this website. A personal project. I interviewed one person and that person has suggested someone else to interview who suggested someone else… I’d recommend episode three (“Doppelgangers, Porch Lights, and Voting Rights“) or my latest episode (“Two Days in Ferguson, MO“). The most obvious example of my ability to create new projects by collaboratively working with others is Leading Notes, the online magazine I co-founded and co-edit. With an editorial mantra of “pedagogy as narrative”, I worked to create a project that was This American Life meets music education meets the digital magazine. The end product has received praise from leading thinkers in the field of music education, was the recipient of an EduBlog award, and proves to be a useful resource that fills a real gap within the profession. Additionally, we partnered with CIA Publications to offer a book club that featured the author in a podcast we published. Overall, the functional breadth and aesthetic clarity of Leading Notes is a good representation of my need to create something new and my abilities to craft a product and manage the number of people required to get it off of the ground. After developing a theme, my team and I had to recruit contributors, commission artwork, produce supportive materials (podcasts, videos, photos), and run our social media. Below is a list of some of my favorite pieces that I have personally edited for Leading Notes. While most of the stories on Leading Notes were written by wonderful music educators, many of them had little previous experience writing for an online audience. I hope these articles show my ability to identify talented individuals and help guide them through the process of making compelling online content. Through my writings on Leading Notes, Moving Forward with Music (my blog), and various academic journals, I have demonstrated my ability to create engaging content. Below is a list of articles that have received a lot of attention within the small world of music education. An Unsolicited Address to the Music Educators of America – My first Leading Notes contribution. This article, for our “State of the Profession” issue, provides the best glimpse into my macro conception of music education. What We Get Wrong: An Illustrated Guide to our Advocacy Mistakes – An article referenced in USA Today and by NAfME. Scott Shuler, former NAfME president, even provided his own thoughts in the comments. This piece went as viral as a music education post can, receiving hundreds of Facebook “Likes” and Twitter retweets. Fun Times and Laser Beams (or “What I learned from Ke$ha) – This is just one of my favorite blog posts. It’s short, situated in a concrete example, and kind of fun. Whose Tradition? : The “non-traditional” music student and the power of words – My call for the “progressive ensemble”. A nice example of how my Communication background influences my thinking on music education. Love, Loss, and the Bb Concert Scale – A true story about a teacher’s love for her students and the power of music to help heal. Soundwalks: Mapping Our Schools and Community Through Sound – Both a philosophical piece and a step-by-step guide, this article includes a project I developed for high school students and a supplemental video. Equalizing Secondary General Music: Our Primary Concern – Originally published in the Spring 2011 Illinois Music Educators Journal, this article focuses on the philosophical underpinnings for our profession seriously committing to secondary general courses. See Nick Speak. Speak, Nick, Speak! Click here to view Nick's resume. 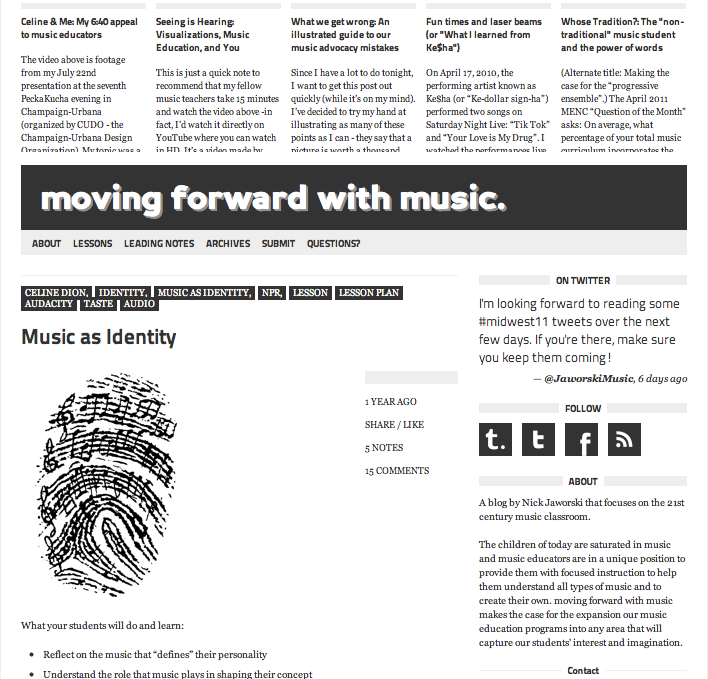 Click the image to read dozens of articles by me about music education. Nick has served as a consultant to both Spotify, Jake Shimabukuro's Four Strings Foundation, and an in-development PBS music education program. Leading Notes is the online magazine that I co-founded and co-edit. We've published some of the most forward thinkers and practitioners in the field of music education. We were recently a finalist for an Edublog Award - recognizing excellence in educational blogging. Check out both "Connections" and "The State of Music Education"!